With less than two weeks left in the current year, I thought it’d be interesting to take a look at the so-called January Effect. In short, the effect is a supposed rally every year in January, which is interesting given the past three years have consecutive negative returns for the month. Another thing to note is also the supposed “January Barometer”, which hypothesizes that a positive (or negative) return in January predicts a positive (or negative) S&P 500 return for the rest of the year. 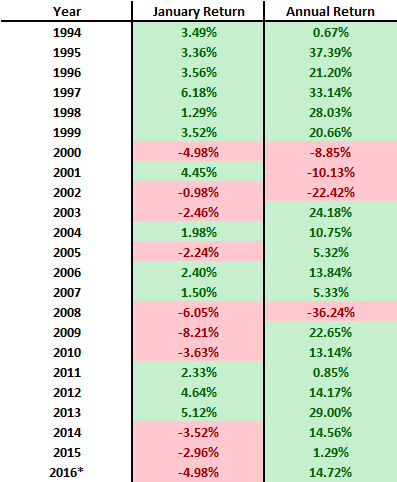 Below, I’ve created a table for every year since 1994 showing the return in the corresponding January of that year as well as the overall annual return. Note that 2016’s Annual Return figure is a Year-to-Date measure as of December 21, 2016. From the table, it doesn’t seem that the January effect is very pronounced. Out of the 23 years, 10 have had negative returns, which means a little under half the total years were opposing the theorized effect. In addition, it can be noted that SPY typically trends upward, except for the crash of 2000 and 2008, which is another validation to just take losses early and get out when markets start tumbling. Had you bought at the peak of 2000, you would’ve only broke even in 2014 in a buy and hold index strategy.